In 1963, some successful businessmen had some pretty lofty goals forming this legal corporation. Their stationery was printed with the OIDC name and the slogan, “Devoted to the Future of Oxford”. Judson Behe, who became the first President of the Oxford Industrial Development Association; C. Kenneth Race, the Mayor of the Village of Oxford at that time; David L. Emerson; Lester M. Cooper, Sr.; Robert S. Marshman, C. Vernon Stratton; Herbert S. Crumb; Paul W. Kelly; George R. Stratton; Anthony M. Paino; and Harold W. McKenzie were all local entrepreneurs who felt they had to get involved and give something back to their community to help Oxford thrive. 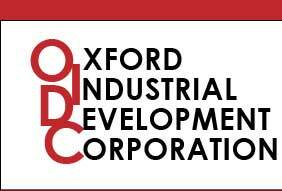 The OIDC bylaws outline that the corporation can study and promote economic growth, acquire real estate for industrial, manufacturing and commercial facilities, secure loans, provide advice and technical and financial assistance to others in the management of their properties, affairs and businesses. The corporation shall not be conducted or operated for profit. One month after forming the corporation they had their first client, the Crescent Corset Company. Crescent, the manufacturer of intimate apparel products for women, had been in business since 1920 in Cortland. They were looking to expand in a new location and the OIDC contracted to build them a welcoming workspace funded by private investments. Land was purchased from Helen and Joseph Laljer south of the Village on Route 12. A steel building was purchased and constructed within a year and the Crescent company began production. A year later, the Crescent Corset Co. was employing 120 people and wanted to employ at least 80 more. So, in the spring of 1966, the OIDC had the building enlarged by 50%. Crescent stayed for five more years then moved on. (In 1980, Crescent merged with Lilyette Brassiere Co., which is now a subsidiary of Maidenform headquartered in Iselin, NJ.) No dust settled before new tenants moved in… Automecha. In 1971, Automecha Manufacturing, then a young business, was engaged in the manufacture of blueprinting and folding machinery. They rented the OIDC building until 1984 when they purchased it from the OIDC. Today they are known as, Automecha International, Ltd. (and Asmarc) and their headquarters are still in Oxford today. After twenty years as landlords, they were ready to start anew. The OIDC aggressively sought out other industrial companies, but weren’t eager to build from scratch again. With the proceeds from the sale of the Automecha building, however, they had some venture capital. Over the years, two charter additions were made, “revolving charge” was added and “commercial” facilities was added to industrial. The OIDC focus is on trying to help support and advise businesses and sometimes help with “seed money”. They will give their opinion about what could/should be done about a situation or problem; give counsel as to a decision or course of action. Some venture capital is available.